Show off your Stonemountain love with this roomy tote bag, perfect for trips to your favorite fabric store! A zipper top keeps everything secure and a handy inner zipper pocket makes sure you don't lose your matching thread. 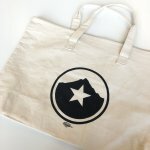 Sturdy 10 oz 100% cotton canvas, 25" cotton canvas handles, and 5" gusset at bottom.